Turkish Apple tea is very specific and different to any teas you might be used to having in your country. As you walk around Kusadasi, take a look at the merchants sitting in front of their stores. Often times, you will see them holding a little, tulip-shaped glass in their hands, served on top of a little saucer. If you’re wondering what it is they are having, it’s Turkish apple tea! Turkey being the fourth country in the world for tea consumption, you will see people having tea everywhere and anywhere. 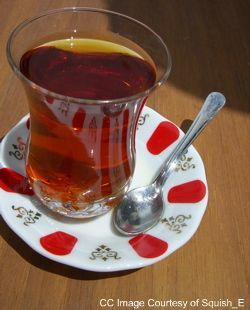 Together with robust black tea, apple tea is among the most popular choices for the Turkish. When you go to a Turkish rug demonstration after your Ephesus shore excursions, or if you just walk into any stores during your Kusadasi shopping spree, it is very likely your hosts will automatically offer you some! Apple tea is very specific and different to any teas you might be used to having in your country. It is based on a regular black tea but they add apple flavouring and sometimes even blackberry leaves, hibiscus, pineapple and lemon to it, which produces a unique fruit flavoured drink. You can add sugar to it but no milk! You can have it both hot and cold. Actually, after a long Ephesus shore excursion, having a cup of hot apple tea will quickly cool your body down. After trying some of this tasty tea in Kusadasi, it is only natural it will be on the top of your list of things to buy in Kusadasi. You will find Turkish apple tea in many stores in Kusadasi. It is often sold as instant powder, which makes its preparation very easy… all you need to do is add some powder into some boiling hot water. Tourist packs of apple tea often come with a little gift of a tulip-shaped glass and little spoon, which makes for one of the authentic Turkish souvenirs to take home with you! If you are looking for a good tour operator in Kusadasi that will also direct you to some good places to buy Turkish tea and other souvenirs, check our page Daily Ephesus tours. Like Turkish Apple Tea page?